That’s right. The White House wants to make it illegal to refuse to hire someone based on their current employment status, and subject employers to litigation if they are alleged to have done so. The President says it “makes absolutely no sense” not to hire someone who has been out of work for an extended period of time. Even I can think of a couple of reasons why it would make sense. Companies may want people familiar with the latest trends and conditions in their industry, so that they don’t have to spend money training them up. Is it irrational for a hospital to prefer a nurse from their crosstown rival over a nurse who took five years off and is trying to get back into the field? Some firms may find that narrowing the field of potential hires in advance makes the hiring process more efficient. This may or may not be a sensible calculation for any particular business. But I’m not prepared to second-guess them or assign malicious intent without a lot more specific information. In any case, if a firm that refuses to consider the unemployed is wrong about the costs and benefits of doing so, they’ll lose business to competitors that recruit differently. Subjecting companies to the risk of job-discrimination litigation is justifiable in the case of pervasive, historically rooted evils like race or gender bias. But burdening the private sector for this dubious new purpose, in these difficult times, would be a big mistake. Let’s accept, for the sake of argument, that many employers discriminate against the unemployed in hiring decisions. That doesn’t mean a legal response is required. However much discrimination against the unemployed exists in labor markets, there is no reason to believe it is as pervasive and intractable as was, say, racial discrimination. Among other things there are no formal or informal government sanctions against those who hire the unemployed, no risks of boycotts, and no bands of bigoted thugs threatening to punish those who do not toe the line. Further, making discrimination against the unemployed illegal and unleashing plaintiffs’ lawyers on private firms hardly seems like an effective solution. To the contrary, it would give private firms yet another excuse to avoid hiring in the first place. Since their profits depend on making sure they end up on the right side of every transaction, insurance companies are proxies for all kinds of modern dilemmas. For example, when they started factoring global warming in their underwriting, even as America was neck deep in a useless and political argument, it was a sign that their mathematicians had already decided it was a real problem. This week, the folks from Virginia Uranium held an editorial board meeting for the Hampton Roads newspaper right before their appearance before the Virginia Beach City Council. They were there to debunk the city-sponsored study showing that uranium mining in Pittsylvania County could imperil the water supply for a million people in Hampton Roads. Which raises the question: If there’s no risk, it should be easy to buy insurance to guarantee the people of Virginia clean water. That is, after all, how insurance works. If there’s no risk, there’s almost no cost to insure against it. When a star insures her physical assets, for example, the cost of that publicity stunt is low because the risk is, too. Virginia Uranium’s representatives spent almost an hour explaining how the Virginia Beach study got it all wrong. How there’s no way that their mine could lead to contamination in the city’s water. That not even a hurricane could wash mine tailings into the reservoir. That’s when one reporter asked the insurance question: So, would you like to buy a policy? It was an absurdist question with a real point: Put your money where your risk analysis is. But Walter Coles Jr. and the scientist who reached the zero risk conclusion, Alan Kuhn, looked uncomfortable. That’s not how these things work, they responded. That’s a regulatory issue. Companies don’t insure populations from risk. We could get rid of all that pesky regulation if corporations like Virginia Uranium would shift the risk from taxpayers to themselves. If companies would pay the real cost of the dangers they present. If they would insure bystanders against the catastrophes they might cause. That’s about when the earthquake shook from a fault a few miles from the North Anna Nuclear Power Station. I’m sure there was no connection. Water is perhaps the most significant means of dispersal of uranium and related …[radioactive materials] in the environment from mines and mine wastes….Uranium is very soluble in acidic and alkaline waters and can be transported easily from a mine site. Uranium’s radioactive components, particularly radium and radon, are highly soluble in water, which would be a dangerous experiment for a state like Virginia with over 42 inches of rain per year. The history of uranium recovery and management in the United States (and, indeed around the globe) is replete with environmental damage, serious worker safety and health abuses, and harm to entire communities….Additionally, most of the environmentally damaged sites have not received adequate cleanup of past harms, and for what little cleanup has been done, most of the cost has been borne by taxpayers rather than the companies and associated beneficiaries of the uranium mined. Currently, the EPA lists 23 National Priorities List (NPL) sites where uranium is a contaminant of concern …. Uranium, however, is explicitly excluded from the scoring system that is used to place sites on the NPL precluding most abandoned mines from being listed. For more about environmental and human health impacts from different types of mining, even after studies promised minimal or no impact, go here. Numerous health problems are associated with uranium and its associated decay products. These include cancer from radon, birth defects and kidney problems from uranium, bone cancer and leukemia from radium, and lung and skin cancer from arsenic. According to the EPA’s TENORM Report, “Water is perhaps the most significant means of dispersal of uranium and related [radioactive materials] in the environment from mines and mine wastes…Uranium is very soluble in acidic and alkaline waters and can be transported easily from a mine site.” This is bad. No state in which rainfall exceeds evaporation has ever allowed uranium mining within its borders. If Virginia allows uranium mining, it would be the first. Water is used (and contaminated) in the milling process. In addition, rain falling on waste products from the mining and milling processes picks up radioactive and other toxic elements which can end up and remain in surface and ground waters for thousands of years. In the 1980s, Marline Uranium estimated that the waste pile from their proposed Virginia operation would cover 930 acres, 100 feet deep. Mining and milling the proposed Coles Hill site in Pittsylvania County would generate hundreds of acres of radioactive waste and contaminate millions of gallons of water. To mine uranium safely, hundreds of millions of gallons of contaminated and radioactive water will have to be prevented from running into Virginia streams or leaching into the ground water. Virginia’s most populous communities lie downstream of the uranium leases filed in the 1980s. Map of Drinking Water Resources downstream of 1980s N. Piedmont Leases. Map of Drinking Water Resources downstream of Coles Hill. Not only does the Virginia Piedmont have greater annual rainfall than other uranium mining communities, it also has greater acute rainfall events. Two of the top five most intense 12-hour storms in the United States occurred in the Virginia Piedmont. Map of 12-hour storm events. Twenty-seven inches of rain fell on Nelson County in 1969. Twenty-nine inches fell in Madison County in 1995. Significant flooding also happened in Pittsylvania County in 1996 during Hurricane Fran. View home video footage & map of the flooding event. This experiment should not be conducted on Virginia. Virginia should take no action to initiate or sanction a study of uranium mining until the proponents of mining provide reviewable information demonstrating that mining and milling have been undertaken in five places with climate, geology, and population density similar to Virginia and in such a manner as to safeguard the environment, natural and historic resources, agricultural lands, and the health and well-being of citizens of those communities. Here are some maps related to uranium mining in Virginia, courtesy of the Piedmont Environmental Council. Map showing counties with former uranium mining leases located in Virginia’s Piedmont. Map showing drink water sources located downstream from the proposed Coles Hill Uranium Mining site. Map showing former uranium mining leases in Pittsylvania County, VA.
Major water supplies in Southside are located downstream from properties with former uranium mining leases. There are major safety concerns over mining uranium in wet climates such as Virginia’s, which could have disastrous effects on water supplies. Major water supplies in the Piedmont are located downstream from properties with former uranium mining leases. There are major safety concerns over mining uranium in wet climates such as Virginia’s, which could have disastrous effects on water supplies. Map showing former uranium mining leases and downstream water supplies in Virginia near Fredericksburg. Maps showing a proposed 930-acre uranium tailings storage, overlayed on a map of downtown Richmond, Virginia. A map showing potential uranium located in Virginia. View water supplies in the Piedmont and Southside regions of Virginia that would be potentially impacted by uranium mining. This map also includes properties with former uranium mining leases. In the 1980s, uranium leases were filed on thousands of acres of land in Virginia including Fauquier, Orange, Culpeper, and Madison Counties, stretching along the Piedmont to Pittsylvania in Southside Virginia. At that time, the Commonwealth undertook an extensive study of uranium mining. It was costly, time consuming, and divisive. When it was over, the General Assembly and Governor decided it was in the best interests of the people to maintain a moratorium on uranium mining in Virginia. A new corporation, Virginia Uranium, Inc., is seeking to lift the moratorium. Although the primary focus on the uranium debate has been on the Coles Hill site in Pittsylvania County, most of Virginia’s population would be impacted by uranium mining, especially areas downstream or downwind of mining sites. There are three forms of uranium mining: open pit mining, deep mining; and in situ leaching. Open pit mining creates large holes dug into the ground to remove the ore and waste rock which impedes ore extraction. This method is frequently used when the desirable ore is close to the surface. The mining operation planned in Pittsylvania County in the 1980s would have been a 110-acre hole, 850 feet deep. Deep mining creates shafts dug into the ground to reach ore at deeper levels. In the last decade, in situ leaching has become more widely used. In situ leaching uses a solution that is injected into underground uranium deposits to extract the uranium from the other minerals. The liquid, now pregnant with uranium, is pumped to the surface where the uranium is taken out of the solution. This process is repeated until all of the uranium is extracted. Information available to PEC indicates that pit mining most likely will be used in Pittsylvania with the possibility of some deep mining, as well. Uranium milling involves extracting uranium from mined ore. The ore is crushed into sand size particles and the uranium is leached out. The uranium then is precipitated out of the leaching solution and dewatered, dried, and packaged. Through the extraction process, uranium is concentrated into a product referred to as “yellowcake.” In situ leaching is a combined mining and milling operation. Enormous quantities of radioactive waste are generated by uranium mining and milling, with only 2 to 4 pounds of concentrated uranium oxide yellowcake obtained from each ton of ore taken out of the ground. The resulting waste, or tailings, contain 85% of the original radioactivity and remain radioactive for hundreds of thousands of years. Tailings can contain several hazardous substances, including radium (which decays to produce radon) selenium, molybdenum, uranium, and thorium. The mill tailings and the mill tailings effluent are highly radioactive and acutely hazardous. The Congressional testimony of Dr. Doug Brugge, of the Tufts School of Medicine, described uranium ore “as a toxic brew of numerous hazardous materials.” For the full transcript of Dr. Brugge’s testimony, go here. According to EPA’s Technologically Enhanced Naturally Occurring Radioactive Materials (TENORM) document, most tailings piles are located in arid areas of the western U.S where low precipitation decreases the potential for water contamination. Still, even out West, there are problems with water management around uranium mines. Because uranium is highly soluble, surface and ground water are the most significant means of dispersal of uranium and technically enhanced naturally occurring radioactive materials from mines and mine wastes. Water coming into contact with these wastes must therefore be treated or contained – millions of gallons of water for thousands of years. Read more about water management in the TENORM document, above. 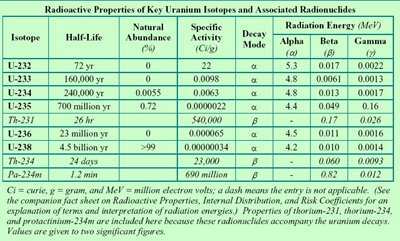 Radioactive Properties of Key UraniumIsotopes, U.S. Department of Energy, Argonne National Laboratory, EVS, August 2005. The National Research Council is involved in a study to examine the scientific, technical, environmental, human health and safety, and regulatory aspects of uranium mining, milling, and processing as they relate to Virginia. The purpose of this study is to assist the Commonwealth in determining whether uranium mining, milling, and processing can be undertaken in a manner that safeguards the environment, natural and historic resources, agricultural lands, and the health and well-being of its citizens. The study results are not due out until December 2011. Yet, Virginia Uranium, the company that was the main proponent of the study, has announced that it is already preparing legislation to lift the uranium ban during the next session of the General Assembly. This suggests that the study is only a pretext for Virginia Uranium. Virginia Uranium, their lobbyists and their friends in the General Assembly appear ready to move forward, no matter the cost to Virginia’s health and environment. On September 5, 2011	by Tim	With	0 Comments	- Endangered Species Act, Wolves! I previously discussed the wolf delisting rider to the budget compromise bill. I think it would be useful to summarize recent court opinions concerning the wolf, and consider the effects of the rider on those opinions. The rider never mentions “wolf” or “delisting.” It simply requires the Fish & Wildlife Service (FWS) to reissue its April 2009 final rule (74 Fed. Reg. 15,123). That rule effectively delisted the “Rocky Mountain Population” of gray wolves from the endangered species listing. This delisting includes parts of Washington, Oregon and Utah, and all of Montana and Idaho. The population in Wyoming, however, was not delisted because Wyoming lacked “adequate regulatory mechanisms” to protect the wolf. After a District of Montana court order, FWS reversed its April 2009 final rule on October 26, 2010. FWS also delisted the “Western Great Lakes Populations” of gray wolves in a separate rule (74 Fed. Reg. 15,070), also issued in April 2009. This second rule encompasses all of Minnesota, Wisconsin and Michigan, as well as parts of North Dakota, South Dakota, Illinois, Indiana and Ohio. Prior to this rule, FWS issued a similar delisting rule for the Western Great Lakes Populations of gray wolves in 2007 (72 Fed. Reg. 6,052), but that rule was struck by the District Court of D.C. in 2008. In this litigation, environmental groups challenged the 2007 FWS rule that delisted the Western Great Lakes gray wolf populations. The court held that the statutory language is ambiguous. The court then refused to defer to the FWS interpretation: that FWS can designate and delist a distinct population segment within a broader listing. The court vacated and remanded the rule back to FWS. This opinion shares many parallels with the Defenders of Wildlife opinion, discussed below. Both opinions reject FWS’s interpretation as impermissible given the statutory language and legislative history of the ESA. Nevertheless, FWS issued a new delisting rule for the “Western Great Lakes” populations in April 2009, and it remains to be seen if that rule can overcome the hurdles posed by this opinion. Because Congress did not amend the ESA with its wolf delisting rider, it is difficult to argue that the Defenders of Wildlife opinion is now invalid. And so Congress has, in effect, ordered FWS to reissue a final rule in violation of both the ESA and a direct court order. One could argue that Congress has implicitly delisted the wolf (and thus amended the ESA) with this rider (although I think that is a difficult argument to make). But the fact remains that it looks like Congress is ordering FWS to act in contempt of a direct court order. This opinion goes the opposite direction of the District of Montana. The District of Wyoming declared that FWS acted arbitrarily and capriciously by not delisting the wolf in Wyoming. Weirdly, the opinion begins by quoting at length from A Sand County Almanac (Thinking Like a Mountain). The crux of the problem for the court is that FWS wants Wyoming to designate the entire state as a managed trophy game area, even though most of the wolf habitat is in only part of the state (mainly northwestern Wyoming). FWS seeks to prevent excessive killing of the wolves, particularly under Wyoming’s defense of property law, which allows property owners to kill any wolf doing damage to private property. The court finds the FSA’s rejection of Wyoming’s proposed, more limited management area to be arbitrary and capricious. The court remanded. It did not delist the wolf in Wyoming. This case is specifically protected by the wolf delisting rider, and in fact is the only case specifically mentioned in the rider language. But here the District of Wyoming remanded the final rule to the agency. FWS could choose not to delist the wolf and, in theory, still comply with this opinion. This case has gotten most of the recent press. This April 2011 opinion rejected a proposed settlement that would have delisted the wolves in Montana and Idaho. The court objected that it cannot approve a settlement that would, in effect, violate the ESA. The reasoning behind this case parallels the court’s earlier August 5, 2010 decision, and the rider will likely affect both decisions equally, if at all. In short, the wolf delisting rider requires FWS to reissue a rule that was remanded by two courts: District of Wyoming and District of Montana. Republishing the rule without revision, as the rider seems to require, will be unresponsive to both court orders. And the rider protects at least one of those orders (the District of Wyoming). Perhaps FWS will determine that compliance with both the District of Wyoming and the Congressional rider requires it to revise the rule before re-publication. And we have yet to see a good argument for why Congress should be allowed to exclude this reissuance of the rule from all judicial review, or how reissuing this rule achieves the Congressional goal: delisting the wolf. During storms like this weekend’s Hurricane Irene, trees often fall from people’s yards into their neighbors’. Which raises the question: is the person whose tree fell into her neighbor’s yard is liable for any resulting damage? The answer varies somewhat from state to state. But as a general rule, the owner of the tree is not liable in such cases unless he or she was somehow negligent in caring for it. If a “reasonable person” could foresee that the tree or a branch was likely to fall and cause damage that the owner could have readily prevented, there might be liability. In most cases, however, the owner is not liable, especially if the tree was knocked over by an “act of God” like a storm. Findlaw has a helpful explanation here, as well as a discussion of other property law issues arising from trees. Even if you believe you do have a good case against your neighbor, you should think carefully before you start a lawsuit over a fallen tree. Given the high cost of litigation, the money you win might not be much more than what you end up paying the lawyers — unless the damage is really severe. The loss of time and aggravation inherent in suing are also relevant costs, even if nonmonetary ones. And then there’s the cost of damaging your relationship with your neighbor, which is especially important if you plan to live in the neighborhood for a long time. In most cases, it’s worth trying to settle your dispute with a neighbor informally instead of going to court. As an attorney, it’s probably against my interest to encourage people to think twice about suing over minor property disputes. But it’s good advice nonetheless. And part of being a good property lawyer is knowing when to tell your client that a lawsuit may not be the best course of action for them. No teacher [in a Missouri public school] shall establish, maintain, or use a nonwork-related internet site [i.e., a “website or web page used by a teacher primarily for personal purposes and not for educational purposes”] which allows exclusive access with a current or former student [i.e., “any person who was at one time a student at the school at which the teacher is employed and who is eighteen years of age or less and who has not graduated”]. Nothing in this subsection shall be construed as prohibiting a teacher from establishing a nonwork related internet site, provided the site is used in accordance with this section. The law’s reference to “exclusive access” likely includes Facebook pages, because “exclusive access” is defined as “the information on the website is available only to the owner (teacher) and user (student) by mutual explicit consent and where third parties have no access to the information on the website absent an explicit consent agreement with the owner (teacher).” I also assume that “eighteen years of age or less” covers only people up to and including the day they turn 18, rather than including all former students who are 18-plus-up-to-364-days; I infer this based on the assumption that the state is trying to protect minors, though the text could also be literally read as covering anyone who hasn’t yet turned 19. Even if a complete ban on certain forms of communication between certain individuals could be construed as content neutral and only a reasonable restriction on “time, place, and manner,” the breadth of the prohibition is staggering. The Courts finds [that] based upon the evidence adduced at the preliminary injunction hearing, social networking is extensively used by educators. It is often the primary, if not sole manner, of communications between the Plaintiffs and their students. Examination of the statute indicates that … it would prohibit all teachers from using any non-work-related social networking sites which allow exclusive access with current and former students. It clearly prohibits communication between family members and their teacher parents using these types of sites…. Plaintiffs have established a substantial likelihood of succeeding on the merits. 1. To the extent that the plaintiffs’ objection is that class-related communications between teachers and students are restricted by the law, I think that objection won’t fly as a First Amendment matter. The government has nearly unlimited authority to control its employees’ speech that constitutes part of their jobs, including not just the time, place, and manner but also the content of their speech to customers and other clients (such as students). 2. The government probably also has substantial authority to control its employees’ speech on matters of “purely private concern,” see Connick v. Myers, probably including such off-the-job speech, see City of San Diego v. Roe, especially when the speech is to people whom the employees met on the job. This doesn’t mean such control is a good idea — just that the First Amendment has been read as not barring the government from exercising such control over its employees. 3. Nonetheless, the law also applies to teachers’ communication to students that are on matters of public concern — e.g., political, social, and religious commentary that teachers (like others) could spread to people (including students) via Facebook and similar sites. Such a categorical restriction might well be unconstitutional under United States v. National Treasury Employees Union, especially since this mode of speech is banned without any limitation to speech that is likely to be more disruptive to the school than valuable to the speaker and listeners (the showing required by Pickering v. Board of Ed.). 4. The government’s rationale for the law seems to be that it helps prevent teachers from sexually preying on students and former students; and if such speech really seemed likely to have this effect, then perhaps on balance the Pickering showing could be made. But my sense is that it’s quite hard to groom someone for an illicit sexual relationship using Facebook postings, which are available to everyone. And while Facebook e-mail might be hidden, that stems from the use of e-mail generally, and not of “exclusive access” “internet site[s]” such as Facebook. So I’m inclined to say that the law is likely unconstitutional, though the question is closer than the court’s brief order suggests. The New York Times published an article this week about how EPA and other federal agencies have quietly increased the dollar value assigned to a human life, to be used for regulatory impact and cost-benefit analysis. The Environmental Protection Agency set the value of a life at $9.1 million last year in proposing tighter restrictions on air pollution. The agency used numbers as low as $6.8 million during the George W. Bush administration. The Food and Drug Administration declared that life was worth $7.9 million last year, up from $5 million in 2008, in proposing warning labels on cigarette packages featuring images of cancer victims. The reason for the increasing value of human life? A combination of inflation adjustment and choice of methodologies. EPA has tended towards using a capitalized “risk premium” for hazardous occupations such as mining to set a “market price” for risk of death. Industry prefers to use surveys about the price the public would be willing to pay to avoid a statistical risk, or simply to add up lost wages, capping the value of a human life with her expected earnings until death. And therein lies a fundamental flaw in cost-benefit approaches — the illusion of mathematical certainty presented by comparing numbers, while hiding the policy and value assumptions underlying the calculation of these numbers. Given that administrative policy is subject to change from administration to administration, and even from agency to agency within the same administration, perhaps the assignment of a numerical value for human life should not be left to the regulatory agencies at all. If Congress wants cost-benefit analysis to be part of the environmental regulatory calculus (as it has in TSCA section 6, and the Safe Drinking Water Act), then let Congress put a price on life — let’s establish by statute what value Congress wants to use. Many in the environmental community may fear that Congress would pander to industry and low-ball the number, but I think that the opposite might occur were Congress to have to explain exactly what they think their constituent’s lives should be worth. The Appalachian Mountain range dates back 300 million years. Its coal is the residue of peat bogs formed in tropical coastal swamps when there was a single supercontinent, Pangaea. But it takes only a matter of months to tear down a mountain peak using explosives and giant excavators. The technique is both faster and less labor-intensive than underground mining, and allows profitable access to thin coal seams that otherwise might not be worth harvesting. Since the mid-1990s, the coal industry has cut a swath of devastation through Appalachia’s remote, coal-rich highlands, one of the nation’s most dramatic cases of environmental devastation and regulatory failure. The fate of the peaks has drawn international attention, but what goes on in the valleys is in many ways more significant. Each spring, the rain that falls on Appalachian mountainsides gathers into thin rivulets, mixing with spring water and groundwater. These streams, often no more than a foot wide, teem with microscopic, insect and animal life that is the foundation of the forest and river food chains and biodiversity. Plug up those intermittent and ephemeral streams with mining debris, and the ecological fallout extends far beyond the edge of the valley fill, into the surrounding forest and the larger perennial streams and rivers down the mountain. A valley fill, for instance, profoundly alters forest hydrology. When the rainwater hits a valley fill instead of a stream bed, it filters through broken shale and sandstone before flowing out at the bottom. Ordinary minerals liberated from deep inside demolished mountains – heavy metals such as selenium and magnesium – infiltrate it and flow downstream. During the Bush years, government scientists produced a growing pile of studies that show how valley fills foul waterways. FWS biologists found that heavy concentrations of selenium in West Virginia’s Mud River, downstream from the huge Hobet 21 mountaintop mine, were causing deformed fish. A 2008 EPA study showed that a huge increase in “specific conductance” – the concentration of electricity-conducting metallic ions – immediately downstream from valley fills was wiping out entire populations of mayflies, a ubiquitous species whose disappearance indicates broader ecological effects. Destroying waterways and aquatic life are, of course, illegal. But in the bureaucratic funhouse of mountaintop removal, laws may say one thing while actions point in the opposite direction. By a commonsense interpretation, valley fills violate parts of two federal laws, the Clean Water and Surface Mining and Reclamation Acts. But since the 1990s the coal industry and its allies in government have engineered a series of legal and regulatory workarounds. Yet it’s the Clean Water Act that environmental groups have relentlessly focused on, filing a series of lawsuits charging the Corps with failing to meet its enforcement obligations, which state that “dredged or fill material should not be discharged into the aquatic ecosystem” if it will cause “significant degradation to the waters of the United States.” Among other things, that includes disrupting the life cycles of aquatic organisms and the loss of fish and wildlife habitat. Again, it seems logical to assume that burying a mountain stream would meet those criteria. But that’s not the way it’s worked up to now. Put simply, the Corps evaluates the environmental effects of valley fills using techniques that many scientists criticize as insufficiently rigorous. Scientists and environmental groups also object to the Corps’ approach to mitigation, the notion that you can make up for destroying one stream by building another one. That might mean digging a new stream bed nearby, or “mitigation banking” in which a mining company pays to protect and restore a wetland elsewhere. This dispute remains unresolved in part because the law divides responsibility for valley fills between the Corps, EPA, the Interior Department’s Office of Surface Mining, and the states. The Corps’ jurisdiction is limited to the stream itself and 100 feet on either side, the OSM oversees what happens on the whole mine site. It’s the EPA’s job to look at the entire ecosystem. And the crossed lines of authority have created a regulatory morass and led to erratic, desultory enforcement. The result has been drift: Coal companies can get permission to demolish mountains and fill streams, but they must also deal with more regulatory hurdles while facing continued uncertainty. It’s this situation, untenable for all involved, that the EPA is attempting to resolve. But the stakeholders do not seem eager for a compromise. At least up to now, the coal industry has usually gotten most of what it wants, giving it little incentive to negotiate. Environmental groups want to see mountaintop removal banned outright. And the Corps, which must also participate in any negotiation, has jealously guarded its permit authority from what it sees as EPA interference. While Obama’s nominee to run the Corps, Jo-Ellen Darcy, handled environmental issues for the Senate Finance Committee and is well-regarded by environmental groups, the Corps is notoriously resistant to change. Lastly, it’s doubtful that a true middle ground — in which mountaintop removal continues with limited changes and the mountain environment is preserved — even exists. EPA hopes to limit the damage to stream beds by reducing the size of some valley fills, paying more attention to their placement, and by doing more, and better, stream restoration. Such a negotiated, incremental approach could blunt some of the damage, but may not significantly reduce the vast scale of mountaintop projects. And coal companies will resist major changes, especially in the size of valley fills. A study commissioned by the EPA found that sharply limiting the size of valley fills would also restrict the amount of coal harvested. Capping them at 35 acres — a fraction of the size of the average fill, which can cover hundreds of acres — would reduce mountaintop coal production by 77 percent.